San Francisco has a couple of iconic bridges. The most famous is the Golden Gate Bridge, spanning the Golden Gate between the Pacific Ocean and the San Francisco Bay. 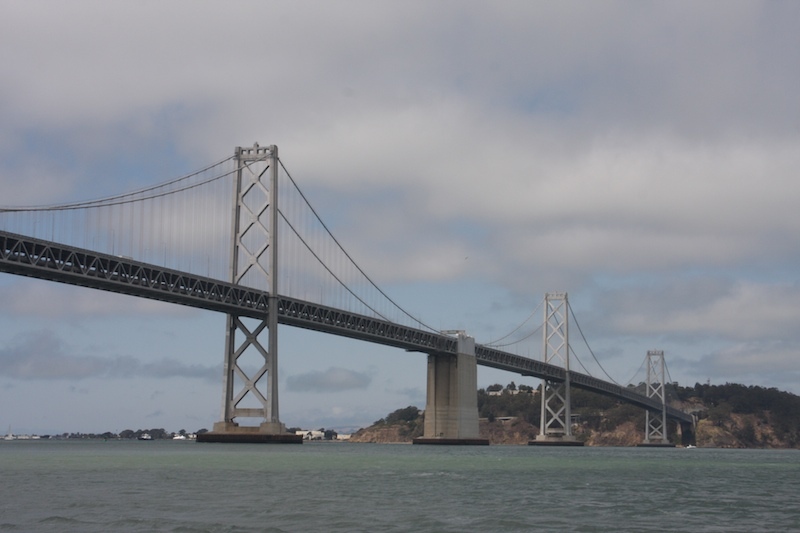 But our other bridge, The Bay Bridge is also quite a spectacular sight. At least on the San Francisco side. The Oakland side, or the East Span wasn't very pretty but more importantly, wasn't safe. In fact, after the 1989 Loma Prieta earthquake, a section of the upper deck broke and collapsed onto the bottom deck. You can see an image of that here. They started building a new bridge in 2002 and it finally opened last night. Since we live so close to the bridge, about a block, we decided that we had to drive on it the night it opened. They said it would open between 9-10pm and people started lining up, wanting to be the first one on. It finally opened between 10:15 and 10:30. We waited till the crowds dispersed and went out after watching the 11 o'clock news. It really was a beautiful sight to see. A very pretty bridge. It takes us less than 7 minutes to cross the bridge from end to end. We drove over it heading into Oakland, turned around then drove back over it into San Francisco. While that 1st view of it coming from San Francisco was quite breathtaking, it really is the most beautiful coming from Oakland going into San Francisco. Here's a video I shot from the Toll Plaza all the way into San Francisco. But I recommend starting the video around 2:30 so you can see us approach and drive under the beautiful new span (especially if you have video A.D.D. like me and can't handle videos more than 3 minutes). If you didn't catch our conversation, Jimmy noticed that the new span is actually in San Francisco city limits, not in Oakland. Which is kinda funny because there's been a long running conversation that Oakland has had the ugly side of the bay bridge and San Francisco has the pretty side. But turns out the new pretty part is also in SF. But it is on the Oakland Side of Yerba Buena Island, so admittedly, that's what counts. If you're interested, here's a 45 second video I shot of the new bridge coming from San Francisco. You can see how it's much more impressive coming from the other side in the 1st video. 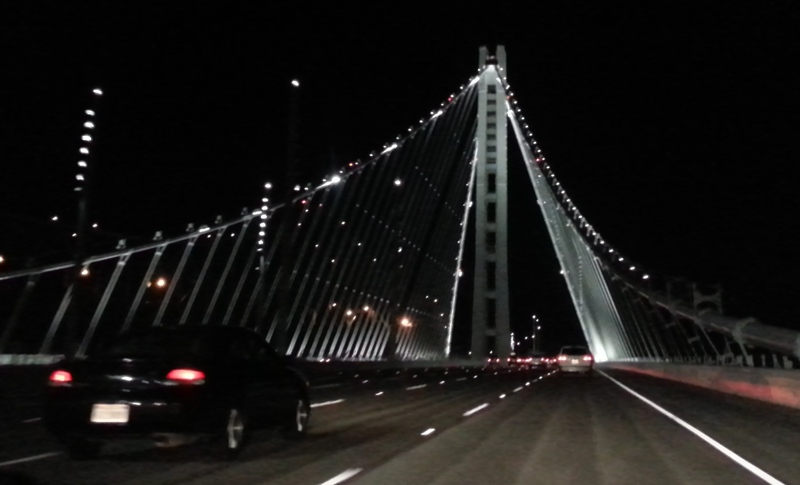 So, one of the main reasons I wanted to cross the new Bay Bridge on the night it opened because I wanted to pay homage to my friend June Bryce who died in February. She drove over it in 1936 when it opened originally. It even opened before the Golden Gate Bridge, so it was a very big deal back then. 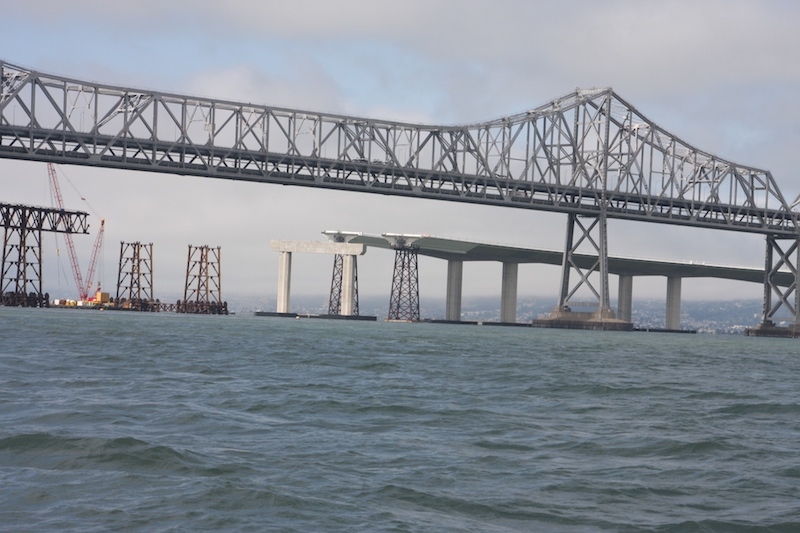 An engineering feat and a great link from San Francisco to Oakland. She was 16 years old and rode over from Oakland into San Francisco with her mom. They spent the afternoon in San Francisco, but the wait to drive back over the bridge into Oakland was several hours long, so they took a ferry back. Additionally, before the bridge even opened to the public, she and a friend jumped a fence and walked across it without getting caught. She was a feisty character, even into her 90s. This was one of my favorite stories she told me. 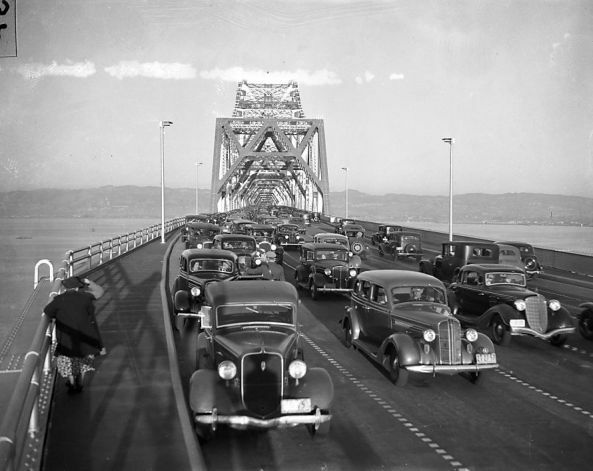 To be able to drive over that bridge on opening day 77 years ago...I just think that is so amazing. She may have been in one of these cars. And just for the heck of it, here's a timelapse video showing the construction of the new span from 2008 till now. i'd like to see this in person. and i'm eager to also try the pedestrian lane. must be gorgeous there too.